(Nanowerk News) Van der Waals epitaxy (vdWE) has recently been identified as a facile synthesis technique in the growth of ultrathin two dimensional (2D) layered materials and their vertical heterostructures. Unlike conventional heteroepitaxy, vdWE utilizes substrates whose surface is chemically inert because of the absence of surface dangling bonds such as fluorophlogopite mica. In the vdWE growth, the overlayer and substrate are mainly connected by weak van der Waals interaction instead of strong chemical bonding. Therefore, vdWE can circumvent strict requirement of lattice matching, enabling the growth of defect-free overlayer with different crystalline symmetry to that of substrate. In addition, vdWE allows overlayer to be perfectly relaxed without excessive strain in the heterointerface. These superior properties of vdWE make it a powerful technique to grow various 2D layered materials with highly single crystalline. As mentioned initially, vdWE has been successfully applied to prepare layered topological insulator Bi2X3 (X=Se or Te) nanoplates on mica, graphene flakes on h-BN or mica, atomically thin III-VI semiconductor flakes on mica and transition-metal dichalcogenide nanoplates on graphene or mica. However, the utilization and characteristics of vdWE on 2D nanoarchitectures for many important non-layered materials are still not very well documented. Furthermore, 2D nanoarchitectures are of great importance in fabricating electronic and optoelectronic device due to their compatibility with traditional microfabrication techniques. A fundamental research of vdWE effects on the growth of planar/lamellar nanoarchitectures of non-layered materials could enable the development of various functional devices such as flexible photodetector. In new work coming out of the Jun He group at the National Center for Nanoscience and Technology, the researchers have successfully realized 2D hexagonal tellurium nanoplates on flexible mica sheets via vdWE. The results have been published in the July 2, 2014 online edition of ACS Nano ("Van der Waals epitaxy and photoresponse of hexagonal tellurium nanoplates on flexible mica sheets"). The obtained 2D hexagonal Te nanoplate shows highly single crystalline, large lateral dimensions (6-10 µm) and thin thickness (30-80 nm). Due to the absence of surface dangling bond on mica substrate, Te adatoms have a high migration rate along the mica surface and thus promptly move towards growth sites, which results in a fast lateral growth of 2D Te hexagonal Te nanoplate without strict lattice match. Unique 2D geometry of regular Te hexagonal nanoplates facilitates their fabrications into functional electronic and optoelectronic device. 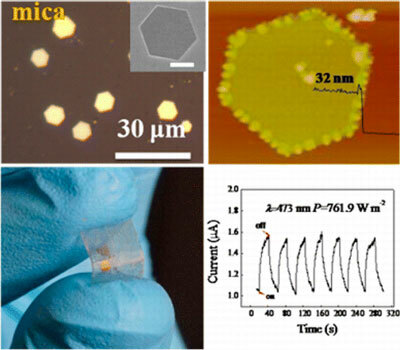 In this work, they have fabricated single 2D Te hexagonal nanoplate photodetector directly on flexible mica growth substrate. High photoresponse is observed in two-terminal 2D Te hexagonal nanoplate device even after bending the flexible mica sheet for 100 times. Their work extends the research area of 2D materials from layered materials to nonlayered materials which will bring out intriguing electronic properties.